The hull is the same as the original model so no diference to the boat performance or handling and has the same volume. 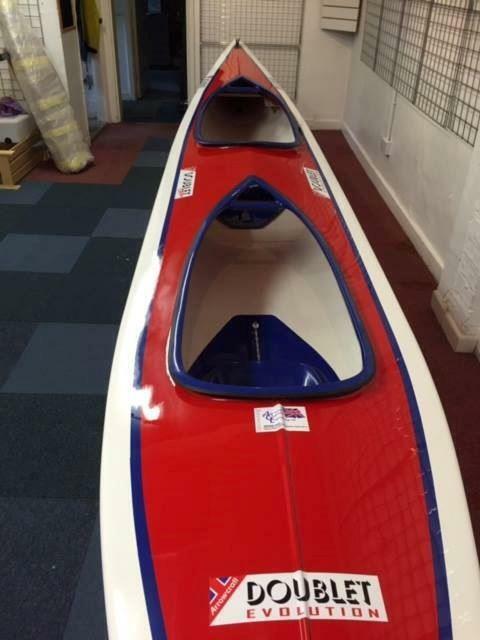 The arrowcraft Doublet or sometimes called the souxie is a fast and stable touring double kayak which after nearly 30 years is still a very popular touring and racing kayak. The sea cadets still use the doublet for their one class racing regattas. The kayak is made from hard wearing glassfibre and diolin fabric which will give it years of use with minimal wear and weighs approx 19 kg. Please note this boat is built to order and can take anything from 4-12 weeks to be ready for collection. Please note due to its size, this item is not included in the free delivery option online. Please get in touch for a bespoke delivery quotation.